The hint in the title is GOLD and the answer is the year 1981. In 1981, a Superbowl ad was $275,000, 750 MILLION people watched Prince Charles and Lady Di get married and GOLD lost 32.8%. In 2013, the cost of a Superbowl ad was $4 million, Prince William and Kate Middleton welcomed Prince George, and GOLD lost 28.3%, the most since 1981. If history repeats itself, Superbowl ads may get more costly, the royal family may have more babies, and gold may be doomed for a long recovery period. In fact, the recovery period for gold after the 1981 loss lasted 25 years – that is 10 years longer than the marriage of Prince Charles and Princess Diana. Source: S&P Dow Jones Indices. Data from Dec 1980 to Dec 2013. Past performance is not an indication of future results. This chart reflects hypothetical historical performance. Please see the Performance Disclosure at the end of this document for more information regarding the inherent limitations associated with backtested performance. 1. After the large gold selloff in 2013, do you believe gold can still be viewed as a safe-haven? The idea of gold as a safe haven doesn’t mean it is always a profitable investment – it just means investors are comfortable with gold as a store of value in uncertain economic times. 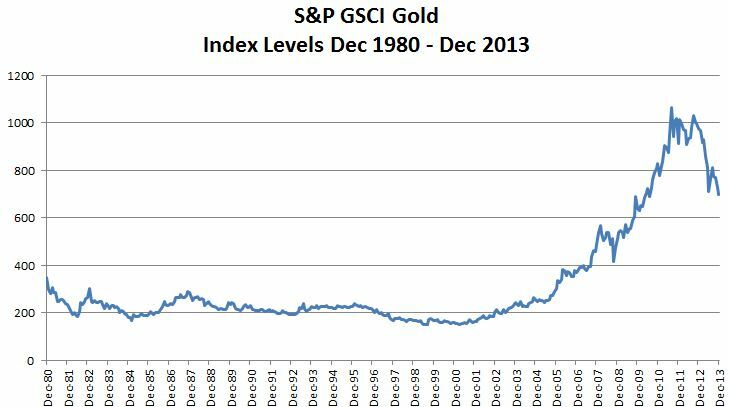 In fact, in 2013 it was the safe-haven concept that drove gold down the most since 1981. Investors feared the fed tapering all year long, which might indicate a stronger economy. 2. Do you believe investors are no longer comfortable with gold as a store of value? Gold as a store of value can be defined by the framework of super asset classes where capital assets, such as stocks, bonds and real estate, provide an ongoing source of value that can be measured using the present value of future cash flows technique. Consumable or transformable assets, like commodities, only provide a single cash flow. Store of value assets such as currency and fine art are not consumed and do not generate income but do have a monetary value. Gold is a unique commodity that has a dual purpose of currency and whether investors are comfortable with gold as a store of value may depend on their view of the relative value to the U.S. dollar, where a stronger dollar is generally bearish for gold. 3. Anything that might replace gold as a store of value that investors might turn to in the new year? The most likely substitutes for gold as a store of value are other currencies or assets like artwork that have a value but no cash flows. It is more logical to replace gold with an asset like the U.S. dollar than with an industrial metal that is consumed/transformed, though cases have been made for using other precious metals like silver or platinum. 4. Besides the fed tapering, what else may drive gold down for 2014? A stronger dollar, low inflation and an increase in producer hedging may be bearish for gold. Higher producer hedging is especially important as an indicator since it is evidence of negative sentiment by the companies that are at most risk from a gold price drop. 5. Are there any bullish factors for gold in 2014? Strong Chinese demand growth may be better for copper than gold, given its economic sensitivity. However, the physical demand growth for jewelry in China has been strong (18% yoy q3 2013 according to the World Gold Council) and Indian consumption may rebound after the government crackdown on imports. Also, it is possible the fear of the slowdown in quantitative easing has been priced into gold already. 6. What do you see going forward for gold? In 2013, the S&P GSCI and DJ-UBS Gold fell 28.3%. The last time gold fell this much was in 1981 when it lost 32.8% and it took 25 years to recover its drawdown. Although in 1982, gold rebounded 12.5%, it lost another 32% in the next 2 years. If history repeats itself, it could take a long time for gold to recover but it could be viewed as a bump in the road of the long bull trend that has gained over 700% in the prior 12 years. 7. Do you have a bullish outlook on any other metals for 2014? There may be a bullish case for industrial metals if Chinese demand growth is strong. Copper is most economically sensitive, though palladium is particularly responsive to the automobile market. However, after the financial crisis, the surplus of inventories has largely depleted in metals like aluminum, lead, nickel and zinc that make them more sensitive to supply shocks and demand increases to support their prices. 2014 may hold the turning point for the inventories from excess to shortage, which is generally profitable.